Money is a huge trail topic. Some people may be surprised that doing a thru-hike and “living in the woods” for 4+ months actually isn’t very cheap. I kept a moderately detailed account of my expenses and was planning on writing this post since the beginning of my hike because I could not find any good answers/ advice on this topic online. It resulted in many snarky responses on the PCT Facebook Group when asked, which were obviously unappreciated. In this post I’m going to share with you how much money I spent strictly on trail (aka not including pre-trail gear purchases for main gear items, or any “home expenses” like a cell phone bill), some explanations on those costs, and some tips on how to be a little more frugal and how I’d save money next time. I spent a grand total of roughly $6,255, +/- $100. I’m giving myself that $100 buffer for the few times I may have forgotten to keep track of a purchase, and rounding. 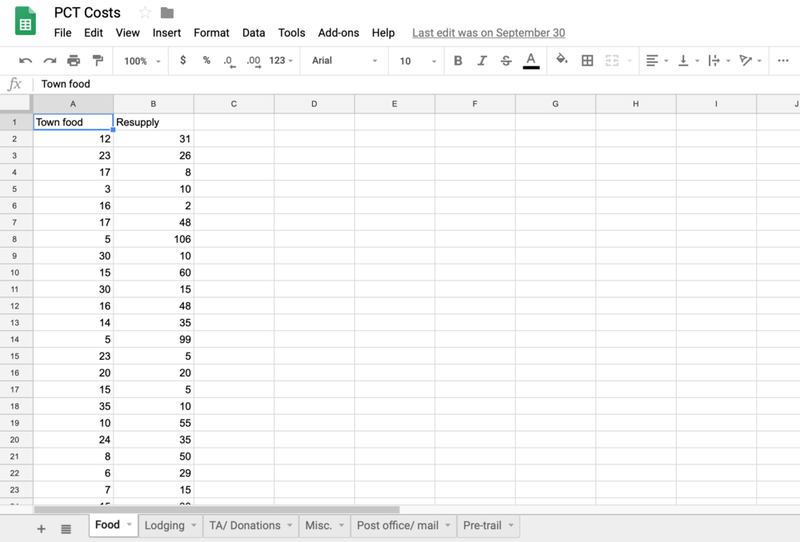 In order to keep track of purchases, I just kept a Google Sheets file that was organized by tab and just put expenses right from my receipt into the correct cell. It’s nothing fancy and it doesn’t use any formulas, but it works. I wasn’t keeping track of expenses any other way. i.e. I didn’t really have a budget, so I wasn’t obsessively making sure I was over my budget, etc. Once I got to the halfway point and realized I had spent less than half of the money I saved up for the trail, I said, “Great! I’m under budget!” And then just kept hiking on my merry way. I understand this is not the case for everyone, which is why I’m making this post in the first place: to try to help people who are trying to set a budget figure out how much money you will spend while hiking the PCT. While I don’t feel the need to justify my costs to anybody, I do want people who are reading this to understand my costs. I treated myself when I felt like it. I didn’t skimp on hotels, food, drinks, etc. when in town. If I felt like buying a milkshake, powerade, and sprite, I bought all of those drinks. If I went out to dinner with friends, I didn’t meticulously calculate who owes who, we just split it evenly (but many restaurants will split checks). I always bought more food than necessary, because town food is the bomb and I can snack on leftovers later. I stayed in hotels by myself for half of the trail because I was hiking alone and didn’t want to hassle with planning town stuff with others. Plus, I wanted my alone time in my hotel. I wasn’t overly luxurious. I usually chose a cheaper option when available, though sometimes I just didn’t care, and towards the end of the trail when I had a good chunk of money left over, I splurged more. So, that should give you an idea of my spending habits. I bought your regular hiker foods, for the most part (see my resupply and food guide for info). I mainly shopped at big supermarkets like Vons/Safeway where I have a loyalty saver card, which got me discounts on some things. If I saw something I liked was on sale, I’d buy more of that and less of other food items for that stretch. There were a couple of times I didn’t have to spend any money on resupply due to a combination of hiker boxes, care packages, and my parents meeting me on trail and buying my resupply. You could definitely do resupply cheaper by only shopping at dollar stores (not a ton on the PCT), or shopping exclusively by sales and buying really cheap things, like Ramen. I laughed when I saw that my town food was more expensive than resupply food. I’m not sure if this is more/less expensive than others, since I don’t drink booze. I’m sure others who drink excessively, or buy pot may spend more money than this. As I said above, I treated myself in town. Usually I just ate breakfast & dinner, skipping lunch because I was still full from breakfast. Town food can also be overpriced because of being in a tourist trap town, or in a really remote place. If you are trying to save money on town food, try buying your food at the grocery store, or just don’t spend a lot of time in town, and don’t drink a lot. Lodging includes hotels, motels, hostels, and pay campgrounds. Does not include donations to trail angels. I spent a good amount of money on lodging, and this is probably the area you could easily save money by making one simple change: avoid town as much as possible. I had a habit of taking full zeros in a lot of towns, which is 2 nights in a hotel. I don’t necessarily regret this, as staying in town helped me mentally at times, but for a future thru-hike, I probably wouldn’t spend this kind of money again on lodging. You can also try to split rooms as much as possible, but I liked town for relaxing and my own time, not spending every minute with other hikers. Sharing rooms with friends can be fun though, except for when you run out of toilet paper. Try to be respectful of hotel policies, and not give thru-hikers a bad name by squeezing a ton of hikers into a room. I didn’t encounter a ton of trail angels with donation jars/ ones who would accept my money when I offered it. I did however, donate to a few key places: Carmen’s in Julian, Hiker Heaven in Agua Dulce, Casa de Luna in Green Valley, and another secret trail angel in NorCal. It is nice to offer donation to these “free” places. Do you have any idea how much it costs to dump and clean port-a-pottys? Me neither, but I definitely want them to keep doing that. I needed to replace a few things, and buy a few new things on the trail. This could actually be a higher number, but my mom bought me new shoes once. I actually think this is a lower number than I actually spent, but I can’t find the receipts of a few things. In reality, you’ll probably need a few new pairs of shoes on trail, if you’re using trail runners, which are usually $80-150, and you may spend another $100 on replacement gear if you don’t replace too much. I had to buy a new rain jacket and rain pants, but they were thankfully on sale. Ideally, you’d just be spending money on replacement shoes. Kind of a lot of money for a misc. category, but it’s a combination of transportation (shuttles, rides), laundry, showers, wifi, and other misc. things like a new phone case or chapstick. The majority of these costs were from mailing all of my Oregon and Washington boxes ($114). There are also some places that charge pick-up fees for boxes, which is included in here as well, and the times I needed to mail things home. I feel like this is pretty much a very average number for a thru hike. Again, some people can do this for sooo much cheaper. I could have easily spent $1,000 less if I didn’t stay in two Best Westerns on the trail, but again, they made me pretty happy when they came, so I’d say it’s worth it. Overall, I would definitely try to save as much money as possible for your hike. Even if you don’t anticipate spending this much money on trail, I think it’s always important to have a little bit of wiggle room in case you get injured, or maybe decide to flip and spend more money on transportation, etc. As always, I’d love to hear your thoughts (do you have any money-saving tips? ), and happy to answer any budget-related questions that revolve around the PCT.